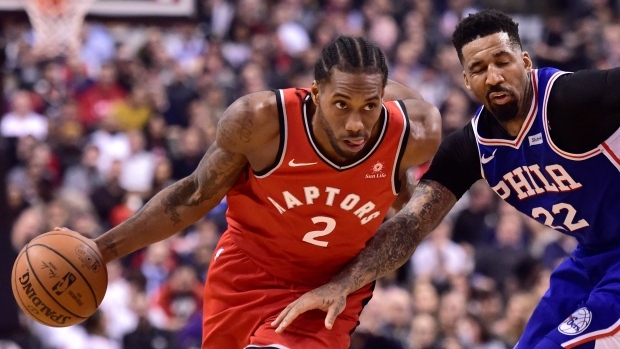 TORONTO — In the dying minutes of Wednesday's win, Kawhi Leonard hauled down a rebound and sprinted coast to coast, leaving the stunned Sixers in his wake, and throwing down an emphatic dunk. "It's good, man, sometimes when you go to the rim, the seas part," said Raptors coach Nick Nurse. "They did for him a couple for times." On a night Kyle Lowry and Danny Green combined for a woeful 2-for-13 from three-point range, Leonard made good on a season-high 5 of 6. He was one point shy of his career high in scoring as a Raptor, which came in the team's overtime win against Golden State. Does he rise to the occasion against the league's best teams? "I think, for him, it's interest level," Nurse said. "Like all of us, there's bigger games than others, and he's an immense talent, he really is. And when the stakes go up a little bit, he's going to play his hand a little harder. I think the juice gets flowing, it gets him a little bouncier with his three-ball and a little quicker with the ball in transition." "It's hard, I'm trying to figure it out, and my place too on the floor," Embiid said on the difference between the two games. "I have got to do a better job, it's on me." The Sixers led for most of the first half, largely because of the Raptors' horrible 3-for-12 shooting from three-point range. They finally found some energy in the third quarter and took a 78-77 lead into the fourth. A 9-0 run by the Raptors' bench put Toronto up by nine points over its Eastern Conference rival, and when Valanciunas took a short pass from C.J. Miles and threw down a huge dunk, it put the Raptors up by 11 with 7:53 to play. "It was our second unit," Leonard said. "They made stops, got rebounds, went on the offensive end and made shots. They did a great job of doing that." Leonard's dunk gave the Raptors a 15-point lead. Butler scored nine straight points for the Sixers, but it barely made a dent in the Raptors' lead. The Raptors beat the Sixers 28-12 on fast break points, and their bench outscored Philadelphia's 41-18. Earlier in the day, social media was buzzing about ESPN's interview with Lowry, who didn't beat around the bush about the DeMar DeRozan trade and his relationship with team president Masai Ujiri. "I felt betrayed because he felt betrayed because that's my guy. That's my best friend," Lowry said. When asked about Ujiri, he said "He's the president of the basketball operation and that's it. For me, I come here and do my job." Ujiri laughed off the comment in an afternoon interview saying "Kyle Lowry is always mad at me." The night, dubbed "Mandela 100," celebrated Nelson Mandela, who would have turned 100 this year. Former Raptors all-star Chris Bosh, Blue Jays legend Joe Carter, and former Chelsea star Didier Drogba were in attendance as part of the festivities and received a loud ovation. The Raptors, who were coming off a 106-103 loss to Denver, were once again plagued by poor shooting in the early going. Leonard connected on Toronto's only three-pointer in the first quarter, and the Sixers took an early nine-point lead. Toronto connected on just two of nine three-point attempts as the Raptors' struggles continued into the second. A three-pointer by Leonard with 37 seconds left in the half capped a 13-0 run that gave Toronto a seven-point lead. The Raptors took a 53-49 advantage into the halftime break. The Raptors' tough schedule continues through the next eight games, which are all against opponents with winning records. Toronto is in Brooklyn on Friday, then back home to host conference rival Milwaukee on Sunday.